For those that are new to the types of boat races that are held in the UK the mere name “The Boat Race” may not hold any level of importance. However, to many this is a big and very important annual event. It is comprised of an annual rowing race that takes place between two very prominent UK Universities which is Oxford and Cambridge. This event sometimes goes by other names like the Oxford and Cambridge Boat Race or the University Boat Race which gives it more clarity. This is not a new event by any stretch. It has been in existence since 1829 but only became an annual event since 1856. Since this time the event has been expanded to include the Women’s Boat Race so therefore the name of the entire event is kept to the “The Boat Races”. The teams that make up this race are known as the Blues. 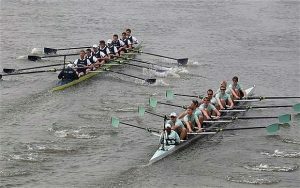 Both teams wear blue with light blue depicting the Cambridge rowers and dark blue highlighting the Oxford team. The watercourse itself is comprised of 4.2 miles along the West London Thames entailing Putney to Mortlake. In the past, there have been other course layouts going back to the Henley on the Thames, then Westminster to Putney. This race has become a popular event not only for the UK but internationally as well. There are enthusiasts who travel to London just to watch this event and become part of the multitude of spectators who what the event live. The event is also televised for those who cannot or are unable to attend. This event also creates many bets, wagers and pools. It is a popular event among enthusiasts and boaters alike, and often creates a sense of friendly competition. If you are looking to get involved, there are both on an offline platforms for placing your bet.